I feel like the performance I had should have been done by someone who locks instantly into Corki and types “ADC or feed”. I watched as each other slot got filled before trying to pick a bot-lane carry. I even got a very hesitant “umm” from my support when I clicked on Sona (only to see if the Arcade skin had been added to my account). I hopped around from Tristana to Caitlyn to Corki. Corki seemed like the best fit for having a Blitzcrank on my team. 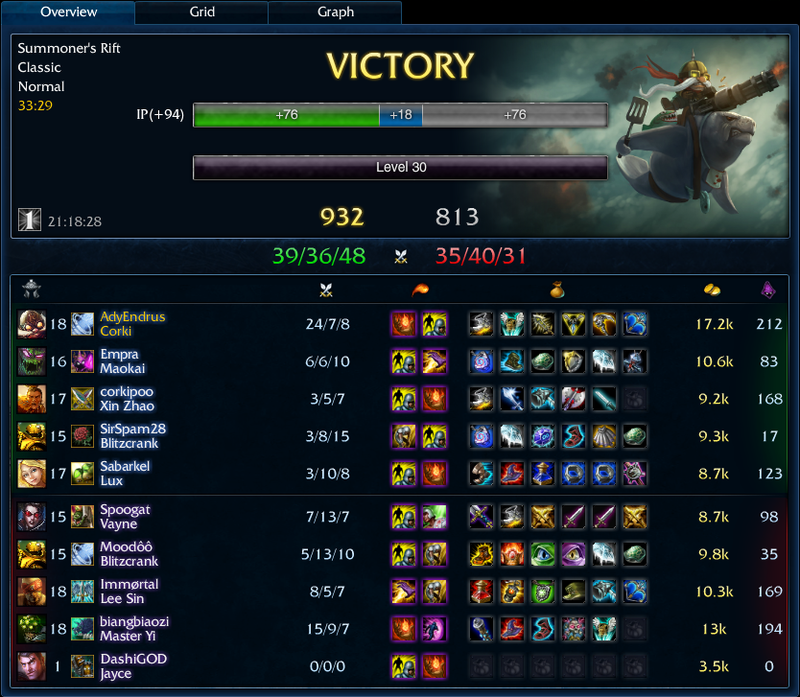 Apart from having two triple kills and a quadra kill this game felt like we should be steam-rolling. It was a 4v5 from the start, but team kill score always seemed very even. I did have a couple of silly deaths late to that AP Yi, but the 5 doran and elixir build on Vayne seemed to not be as viable as others.